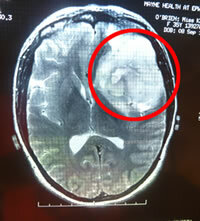 If you were diagnosed with a 4 inch brain tumour, what would you do? … this was something my friend Kelli was faced with having to answer. Given 3-6 months to live, Kelli was diagnosed with a malignant Oli-Giandr-Glioma brain tumour, and turned down the medical prescription of chemotherapy and radium treatment. She embarked on a journey to look for ways and means to overcome the cancer herself naturally. The following video above is an uncut interview with myself and Kelli: If faith was a muscle, would you exercise it? Kelli is a true testament to courage, commitment, self belief and the human spirit. The million dollar question which Kelli is constantly asked is: What did she do to overcome it? This is covered along with many other questions, so make a cup of tea and let Kelli’s jaw dropping story unfold. One last thing. If you got value from our video, we would appreciate it if you could share it with others. Simply click one of the icons below. All blog comments are very welcome too. This is one persons view, and reflects one persons experience and no inference should be drawn that it will reoccur. The views of the interviewee (Kelli) are her own, and do not in any way reflect the views of the site they are published on, other sites affiliated with this site, the staff involved with the site, or any other members of this site. Medical information discussed in this video is not intended as a substitute for advice from a registered physician or other healthcare professional. 180 Nutrition will not be liable for any loss or damage suffered by you through your use of the information discussed during this video. GUY (INTRODUCTION): Hi, this is Guy Lawrence, and thank you for popping by on my blog, “180 Nutrition.” The following video you’re about to watch is of me interviewing my good friend, Kelli. Now, Kelli has a really unique remarkable story to tell. She was diagnosed with a 4-inch brain tumor. Now when you put that into perspective, that’s the circumference of a grapefruit. Upon diagnosis, they gave her three months to live if she wasn’t going to undergo chemotherapy and radium. Now if she was to undergo them, they still weren’t sure exactly what was going to happen anyway. So Kelli chose not to. Five years later, she’s doing better than ever, and this is her story, so please enjoy. GUY: Kelli, how are you doing, mate? KELLI: Good, how are you today? GUY: Yeah, very good, very good. We’ve just been discussing which side of the table we were going to sit on because we both feel this is our best side over there. But being a gentleman, I’m going to give it to you, Kelli. KELLI: Thanks, Guy. Well, I am single, so I might need to have my best angle on the camera. GUY: Yeah. Good point. Good point. So looking back, at the time, how did you find out you had a 4-inch brain tumor in your head? KELLI: I was starting to get sick, and I had passed out, and I went to the doctor—a doctor that I didn’t even know. He was from Canberra. He was filling in with patients for the day, and he just took one look at me and just went, “My gosh.” And I was on my deathbed basically. I was bent over. I just had a chronic headache that you just can’t explain. It was just pounding, and I told him all the symptoms, and he just sent me straight out to the hospital for a scan. And I was just lying back in the bed just in disbelief. GUY: Yeah, I can imagine. KELLI: And not having a clue what the next step was. So it was very shocking. GUY: The thing that’s fascinated me since I’ve known you was what made you at the time make the decision to not have—you’ve discovered you have this brain tumor in your head and you’ve gone and you’ve had scans and things like that. Like from what I recall, they basically put you on an emergency plane to Melbourne straight off the bat. Actually, we’ve got photographs of you. There’s Kelli here. That’s literally after the operation, right? How many days after that is it? KELLI: That was about five days after the operation. GUY: Okay, okay. And then we’ve also got scans that we can show you as well. And you can see the tumor actually pushing the lobe across. And that was taken at the time as well when they discovered it, right? KELLI: Yeah, the first scan showed that it was like the size of grapefruit just sitting behind my left eye, which I couldn’t even fathom. And it was actually my center line that runs down the brain between you lobes was like a dog’s hind leg. It was just totally crooked and bent because the tumor was actually starting to press on my right-hand side of my lobe. And I found out that I’m in the 3% of people where my body’s actually running on the right-hand side of my lobe. So that’s when I started to get really crook because it was pressing on that side. So it hadn’t affected my mobility or my speech, or my limbs, or anything like that because it had switched over. GUY: So when they operated, what did they actually do at the time? So obviously, they’ve opened you up and gone in. KELLI: They opened me up and the main thing was to debulk it and take the pressure off because it was ready to explode. There was no more room for it to grow. GUY: It’s amazing to think of something four inches in circumference that’s actually in your head. KELLI: So all they did was debulk it and left it there, basically. KELLI: So I still have tumor in my head. GUY: So once they relieved the pressure and things like that and obviously they said they’re giving you three months to go ahead if you didn’t have the chemo and radium and everything like that, what made you decide to feel so strongly against that and actually go on your own sort of search for other means of I guess rectifying the problem that you were faced with at the time? I mean, it’s a big call. KELLI: Yeah, I had a friend who had gone down a more natural way and holistic way of things in Aubrey, and I had spoken to her and read her article in the local morning mail, which was just bizarre. And then here I am on that side of things in this position of what I’m going to do. But when I was that shocked and everything, I just wanted to get out of the hospital and get back home to Aubrey where I was living at that stage and sort through my head what I was doing. And I wanted to get straight onto homeopathics and just reassess what I was doing and look at changing everything in my life basically. GUY: Yeah, yeah, yeah. And then so obviously, you sort of started doing your own research and looking at I guess other alternative means of therapy. And what fascinates me now is the things that you’ve chosen and obviously you’re still here today and you’re doing better than ever. So just out of my own curiosity that there must be some sort of way toward that kind of thing. And if you could summarize how did you go about it, what were the next steps that you took. What all that means basically. That’s what I find interesting. KELLI: I looked outside the square, and I was intrigued with what was out there and was trying to find different ways and means of beating this, and I’m still here today five years later. So really, what I’m doing is very basic and works like unbelievably. GUY: What would they be? KELLI: Basically, all it is really is getting all the sugar out of your diet and a healthy protein way of eating. It’s not actually a diet like a fad where everyone just thinks, “I’m going to go on a diet.” It’s not a diet. It’s just a healthy way of eating, and it was a matter of taking all the sugar, fruit, everything out of your diet —carbs, which feed the cancer and helps it to grow. It just fuels it. GUY: Is that what you believe? KELLI: I totally, totally believe that it really helps it grow and feeds it. KELLI: It will find sugar anywhere in your body. GUY: And then so you do weight-bearing exercises you were saying? KELLI: Yes, weight-bearing exercises have also been amazing. They actually burn up the sugar in your body, so you have no sugar for the cancer to feed on. It releases the growth hormone. GUY: So when you say weight-bearing exercises, you mean like going down to the gym and pumping iron? KELLI: Going down to the gym and lifting weights. Getting a program or just getting started. And also, I do Pump and mix it up. I started off very slowly and on light weights. It’s not hard on your body, and it’s very good for mental toughness as well as physical. GUY: So I guess at the time because you still had your full mobility, I’m sure there’s a lot of people with cancer out there that it can affect them physically as well. But in your situation, you were still fully getting around. Were you laid up at all after the operation and things like that for a while? KELLI: They actually get you up out of bed after four days and get you moving around. KELLI: So I bounced back pretty quickly after the operation, and I think I had in my head I just don’t like being sick. And I’ve played sports and I just can’t lie down and take it. GUY: Yeah. Okay. So basically you felt weight training was an integral part of that. GUY: Okay. And anything else? So you’ve talked about cutting out sugars, carbohydrates from your diet. Weight training. Was there any other…? KELLI: Apricot kernel seeds have been really good as well. It’s a natural seed inside the big seed of the apricot. So it has B vitamins and vitamin B17 as well in it. GUY: Okay. And what does vitamin B17 do? KELLI: It’s very healthy. Vitamin B17 gets into your cells and combats the cancer as well. GUY: When I think about the daily diets because I’m working with people helping them lose weight all the time especially, and it’s fascinating. Growing up in Wales as well, I was brought up on a very high-carbohydrate diet. You have your toast and maybe sandwiches, pasta, things like that. So you’ve eliminated all those things from your diet. GUY: I get asked this question all the time because I know eating carbohydrates on a weight gain/weight loss kind of thing plays an important role. But what you’re saying is for somebody in your situation, its massive implications are huge. So what does that leave? What are you eating on a daily basis? So you’re going back to basics I assume? GUY: So you’re basically eating a high protein high fat…. KELLI: High protein, high fat. GUY: Lots of veggies and things like that. KELLI: Vegetables. And I’ve cut out the ones that turn into sugar, which are carrots, pumpkin, and white potato, which turns into sugar when cooked. KELLI: So a bit more raw. Lots of grains, fish, meat. All those. There’s loads of them. If you went onto the website and Googled “protein foods,” it’s endless. GUY: Yeah. Okay. Now it is, yeah. GUY: So another question I wanted to ask you was so you’ve radically changed your lifestyle, so do you think what got you in the situation that your lifestyle was a part of it or were you just unlucky and you’ve been sort of cursed with a brain tumor or do you think the first 30 odd years of your life before your before your diagnosis played a part in it and how you lived your lifestyle? KELLI: Yeah, it did. Definitely I would feel it would have something to do with it. A bit of bad luck I guess, and what I was doing beforehand was abusing my body and drinking and smoking, and way of lifestyle and things like that. KELLI: Yeah, definitely, it’s not at all good for your body. KELLI: Yeah, definitely a wake-up call and also it’s been five years, but I’m on the right journey. GUY: Have you had a drink since…? KELLI: No drink or alcohol. I changed everything overnight, basically. GUY: Yeah, and stuck to it ever since. GUY: Yeah, that’s incredible. So I guess now the other thing I wanted to ask you was five years on, because I know they do scans and it’s still there but breaking down, to my knowledge. You said you saw a gentleman up in Sydney recently. Because you’re obviously still monitoring it and seeing how the regimen is going. GUY: You said you feel better than ever. Do you feel that you’ve now gone over the point of defeating it or is it always there and you’re going to—? GUY: I guess that’s all we need really, isn’t it? KELLI: Yeah. And I’ve found the protein way of eating is very easy for your body to digest and it’s not putting a lot of pressure on your digestive system and your whole system. And I feel mentally and physically just energetic. GUY: That’s fantastic. And I guess if anyone’s watching this now who maybe has cancer and things like that, what would your message be to someone? This has evoked curiosity in me. That’s why I was asking you to film it and hopefully, it will evoke a curiosity in others too at least. Yeah, look at the broad picture before making decisions. I mean, what would your—? KELLI: I definitely agree with looking at the big picture and looking at what’s out there and thinking back to the basics and believing in what you’re doing and what you decide to do. And change your life and look at what you’ve been doing to yourself and face reality. It’s a matter of life or death. So go with how you feel and the body and mind is amazing. It’s an amazing journey. Until this day, I’m still learning. I’m learning about my body like the mechanics. It’s mind-blowing and getting to know yourself, and you can make decisions by getting to know yourself along the way. GUY: Yeah. Another thought would be because from what you’ve told me in the past, is that you absolutely cut off all other options, when you made that decision to bring in the principles you believed in, if you didn’t have 100% belief in it, would it have worked? KELLI: Definitely not. Your mind is so connected to your body, and I feel doing what I’m doing has made me so mentally tough and just so determined. And it’s a challenge that I just love and I beat and I’m overcoming cancer, which is basically just amazing. KELLI: And it’s hard to explain to someone as well that hasn’t had it or is going through it. KELLI: Yeah, definitely. I love it when people ring or call me and ask what I’m doing, and I really love the fact of just trying to get the word out of what we’re talking about. KELLI: And maybe try and help one person to see and understand how powerful this really is. GUY: Yeah. Good on ya’ mate. And I guess that’s all we can cover really. But thanks again. GUY: Really do appreciate it. GUY: Hope You learned something from it. KELLI: Hopefully, this helps somebody out there for sure. GUY: Good on ya’ mate. Thank you. KELLI: I’m not going anywhere. Awesome, inspirational story. She took on the greatest challenge and took charge of her life and now she has come out on top. If you can control your mind, you can achieve anything. Great work Kelli. Kelli, what a story, not only did you have to conquer your fears, but you totally vanquished the beast with your attitude and determination, it is not only an inspiration to cancer sufferers but to us all. Guy I’m very proud that you were a part of her story, I hope you can both make a difference, sharing this video is a great start. Thanks for the feedback guys, it’s great to hear your comments. Kelli is inspirational to be around, and to have her story on the blog is a privilege. Sugar and salt is rare in nature. But it is now pervasive in our lifestyles and contributes to so many of the lifestyle diseases dominant in western society. Eating a low sugar diet and cutting out grains is essential for a healthy life style – before or after cancer. Science has shown 30 minutes of daily exercise reduces your chance of a re-occurrence of cancer by 50%. I would guess that it is a combination of things that brought Kelli’s cancer under control. And possibly the most important of that being her attitude of mind and emotional well-being. I certainly agree with you Chris. Whether if you have an illness or not, regular exercise and eating well have a profound impact on health. But what amazes me is that I have found from working in the industry, many people easily dismiss the importance of eating the basics well and cutting back on sugar. It usually takes a bit of a wake up call before they take action. Guy, do you know where Kelli buys her apricot kernels? I’ve been told that the kernels now available as “food grade” in Australia contain very little amygdalin or vitamin B17. Apparently the authorities are attempting to ban the sale of bitter apricot kernels as food, though they can still be purchased for “cosmetic” use, such as body scrubs or for pressing apricot kernel oil. Thanks very much for that link. I just spoke with these people and apparently they buy their kernels from a company called, ChiTree in Victoria. Coincidentally, I had been speaking with someone ex-The Fountain of Life clinic in Queensland, and they also recommend apricot kernels from ChiTree at http://www.apricotkernels.com.au which they say they tested for B17 content. Apparently they contain more than twice the amygdalin of anything else available. Evidently, they’ve had some trouble with the authorities as a result, which seems typical. Keep up the great work Guy! David, you can purchase Vitb17/amygdalin from iherb. It’s the pure version. You would have to eat a hell of a lot of apricot seeds to get sufficient amygdalin! Good luck. I’m really amazed to hear your story . What an inspiration. Your story touches me because my father died of brain cancer. He did the whole radiation chemo crap which I regret talking him out of to this day . He tried juicing everyday etc, and going vegetarian , but the chemo and rafuatuion eventually destroyed him , but you did it without all that and good on you for eating the apricot seeds( they are disgusting!!) and going low carb , it’s very hard to find the right diet , maybe low carb would’ve been better for dad, oh well who knows, may you live another five years and gain more health thanks for sharing your story . Your story of defeating brain tumor is simply inspiring. My wife has been detected a non-cancerous brain tumor (meningioma-46mm size). I am able to see several protocols for cancerous tumor but none for a non-cancerous tumor. Could you please guide us dissolve meningioma naturally.